I’ve never been much of a one for road trip novels. I started to read On The Road by Jack Kerouac once, and couldn’t bear the pretentious, self-obsessed tone, so it became one of few books I’ve never finished. I’ve never been tempted by Fear and Loathing in Las Vegas either, although I’ve seen the film. So when this novel arrived I really wasn’t sure I was going to like it. The design of the cover and the section headers are deliberately Steadman-esque, and the blurb even name-checks Fear and Loathing. However, despite the similarities (road trip, surreal drug-addled adventures), this novel has a lot more substance than I was expecting, and is in fact an in-depth exploration of the self-indulgent folly of youth. 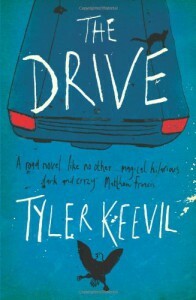 The Drive begins in Canada with the central character, Trevor, hiring a car and heading for the American border. His girlfriend has cheated on him, and the resulting resentment and impotence have led Trevor to sell his expensive movie camera and blow the money on a journey of self-discovery, a visit to a brothel and a blow-out in the Reno gaming houses. Trevor is young, stupid and not sure what he’s really looking for, so this plan is never destined to go well. Forced to swallow his stash of marijuana at the border to avoid being caught, the drive begins very much as it continues, under the influence of a lot of mind-altering chemicals, which isn’t helped by his self-imposed fasting and stopping to buy whiskey and cans of aerosol cream to inhale. As his journey continues, Trevor’s adventures become stranger and more dangerous, including picking up a mysterious hitch-hiker, shooting birds with a bunch of hunters, getting on the wrong side of the leader of the local biker gang, and eating at a diner whose redneck owners may or may not be murdering the clientele and serving them up on the buffet. The line between reality and drug-enhanced fantasy is deliberately blurred, so it’s not possible to tell if these things are actually happening, or simply a manifestation of Trevor’s insecurities. Trevor is a complicated character. Being in his early 20s makes him self-confident but also highly insecure. The drugs and guns seem to be a way of asserting his masculinity, and yet by the end of the novel he is flirting with the idea that his impotence may be caused by latent homosexuality rather than a broken heart. Below the surface, Trevor is a romantic and a sentimentalist, as evidenced by his adoption of a poorly, flea-ridden cat, rescued from the dodgy diner. He wears a plastic visor identical to one he had as a child, purchased from a town he once visited with his father – a symbol of an innocent and happier time. When he eventually arrives in San Francisco to stay with friends, Trevor’s journey has had a profound effect on him, and after some TLC for himself and his cat, and a final show down with his symbolic demons (the bikers), he is finally ready to start reaching some conclusions.